Waking up with sore throat pain, cough, nasal and chest congestion, aches and pains or a fever? I don’t have time for that. Back in the B.C. days (a.k.a. Before Children) it wasn’t that big of a deal if a cold or the flu laid me low for a day or two. I’d call in sick, sleep a bunch, read a book, and order some take in. But now? No way. Life doesn’t stop just because I’m feeling out of sorts. Moms don’t get sick days. Mom is always on duty. Always. It’s one of those things you don’t realize the true enormity of until you’re a parent. I mean you know that being Mom is a 24/7 gig, but you don’t truly understand what that means until you are living it. Back in my B.C. days if I started to come down sick I wouldn’t take cold medication. I had this (incorrect) theory that it made the symptoms last longer. I was stubborn and determined that I’d tough it out. (And, hey, maybe I secretly didn’t mind using up a sick day or two). With sick days no longer an option, I am much more fond of my cold meds. Now, as soon as my body gives me any indication that we’re heading into cold or flu territory, I head for the closest dose of DayQuil COMPLETE. 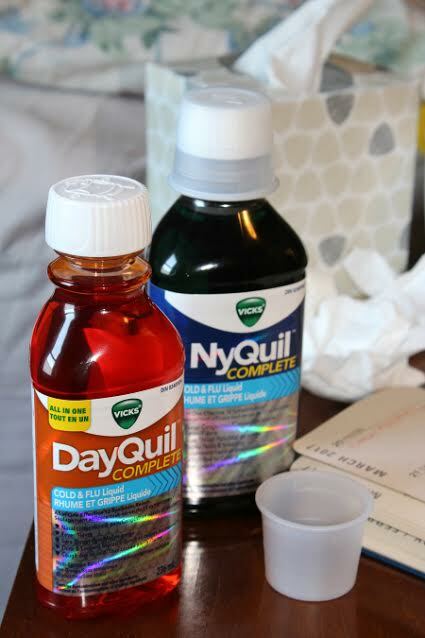 Do not use DayQuil and NyQuil at the same time. To ensure this product is right for you, always read and follow the label. Keep out of reach of children. Moms don’t do sick days. We do day shift, and night shift, and really late in the middle of the night shift, but we don’t do sick days. We don’t have time for sick days. Remember that always on duty part? Yep. No time for sick days. We do sticky fingers and snotty noses. We offer comfort and hugs even when we know our kids are nasty little ticking germ bombs. We still help blow noses and wash dried boogies off of little faces even when we know it increases our own chances of coming down sick. I have trouble with this one, with offering my lap and a snuggle to an obviously ill child. My six year old wants to sit with me when she is sick. The more rotten she feels the more she wants to crawl into my arms, and the more I want to run and hide in another room. I can’t afford to be ill. I have no down time. Moms don’t do sick days. We help find missing mittens. We do up little zippers and wipe faces covered in milk mustaches. We make sure the lunches that we “helped” pack make it into backpacks. We do laundry. We do breakfast, lunch and dinner, but we don’t do sick days. We run to the school in the middle of the day because that lunch pail didn’t actually end up in that backpack, or our kid fell into a puddle and needs a change of clothes. We make after school snacks, for the wild, loud, hungry, little tyrants that come back home to us at the end of the day. We sign tests and agendas and book orders and permission slips. We help with math, and English journal, and speech work, and French reading. We help with the weird last minute projects that come home and are due the very next day. Mom can’t be off sick. I can’t say, “Sorry guys I’m not feeling good. Tonight I’m not signing any of your school work, I’m not helping with anything, and I’m definitely not cooking dinner.” That would so not fly. Moms don’t get sick days. We help with baths. We shampoo little heads and wrap little bodies in warm dry bathrobes. We unstick the stuck zipper on the favourite pair of PJs. We read that chapter of Harry Potter. We give tucks and hugs and good night kisses. We turn off lights, and turn on lights, and adjust night lights, and promise to never ever turn off the hallway light. We pause our favourite TV show to go tuck a little someone back into bed. We stay up late to do that last load of laundry because our kid absolutely needs to wear a certain special shirt to school the next day. We get up when our kids wake up in the middle of the night. We chase off bad dreams and rub away leg cramps. Mom can’t be sick. I can’t get away with, “Sorry you woke up, but it’s 2am, and I don’t feel good, so… um… take care of yourself, kay?” Nope. Not acceptable. Always on duty, remember? 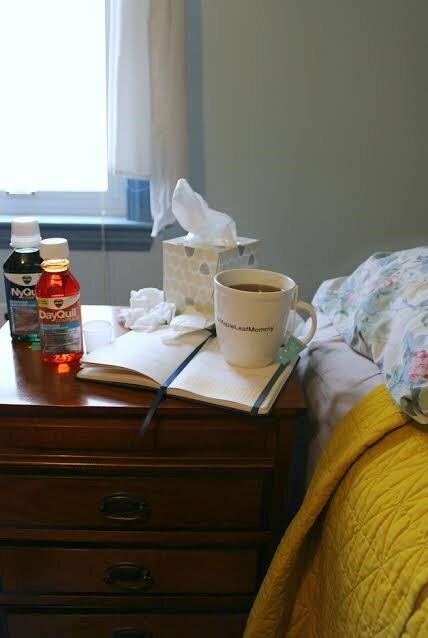 Given that sick days are not an option, how do you survive some nasty flu or cold? The secret weapon I have that keeps me going when I’m sick is a magical combination of DayQuil COMPLETE to relieve my daytime symptoms to keep me moving through my day, and NyQuil COMPLETE to relieve my symptoms so I can get the rest I need at night (barring interruptions from 3am refresher hugs and monster patrols, of course). Once again, do not use DayQuil and NyQuil at the same time. To ensure this product is right for you, always read and follow the label. Keep out of reach of children. You know the drill. Visit the Vicks Canada website. Follow Vicks Canada on Facebook. Disclosure: The post was sponsored by Vicks. As you folks should know by now, I only work with brands that I genuinely love and use, and, as always, my words and opinions are my own. DayQuil COMPLETE and NyQuil COMPLETE, have kept me on my toes when I have been sick, because it is true moms don’t get sick!! Too busy to be sick, right? DayQuil is a brand I use and trust to get me through those sick days. DayQuil has totally saved my bacon on more than one occasion. I don’t know how I’d slog through without it. I dread getting sick, that is one of the hardest things especially when you’re a single parent! Oh I don’t envy you that Leslie, it’s hard enough with two adults in the house. Yup moms don’t get sick days but daddy’s on the other hand……. This is abrand I trust to help me get through some tough sick days. I haven’t used DayQuil in a long time. Next time I am sick (hopefully not for a very long time though) I will give it a try. Fingers crossed you won’t need it for a long while. I know I always feel so helpless when I have a cold. 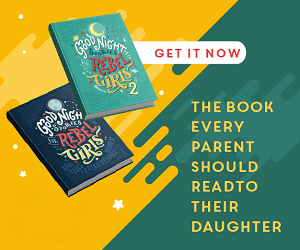 I have definitely relied on Dayquil and Nyquil when a new bug comes into the house – with multiple jobs, a business to run and going back to school ‘sick’ is just not an option! I’m still nursing, so cold medications aren’t an option right now. I always am envious of my husband when he can just reach for them when he’s sick. They do make a difference for him. One day they can be back again for me. 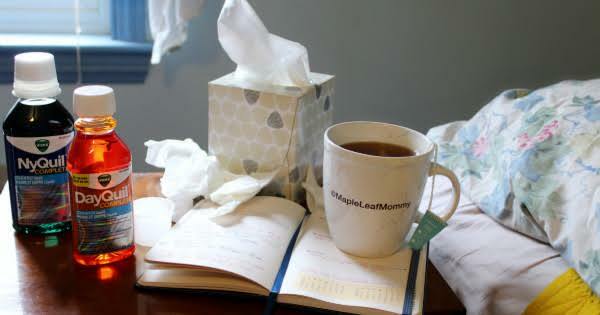 ‘Moms don’t have time for sick days’ is definitely a true saying. I well remember when my first born was about 6 mths old being operated on my big toe. I was told to keep my foot up when I got home. What happened? Hubby didn’t know how to mix baby’s food, so mum had to do it. When I returned to the Dr they couldn’t get the bandage off, I had to soak it for 1/2 an hour and then they gradually peeled it off. They were not happy! As a rule they say moms don’t get sick we always still do what we usually do. No day off. I do my best to rest as much as I can when sick. I’ve not ever tried Dayquil but after my grandson and I were getting sick for the entire chilly season, I think I’ll try it next year! Thanks for the reccomendation! Dayquil is awesome , great for keeping you going …. moms don’t have time to be sick , we can’t take no sick days ! Dayquil is a brand we use too and it has been a lifesaver at times at keeping me going. I haven’t tried Dayquil but NyQuil COMPLETE gives me a really good nights sleep because mom’s don’t get sick days.